Defeating a Pretender boosts any Medal's Skill EXP even further. 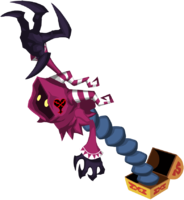 The Pretender is an Emblem Heartless that appears in Kingdom Hearts χ. It was first introduced during the Treasure Chest event in 2015. This page was last edited on 3 April 2019, at 18:29.